Each week for 26 weeks, I am publishing a post about women who are not widely known but should be—women who can inspire us, teach us, and encourage us to get out of our comfort zones and reach for our dreams. 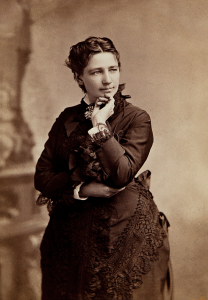 Week 22 of my A to Z challenge introduces us to Victoria Woodhull. V was a particularly challenging letter, as my research led me to so many interesting choices of women, including Violette Leduc, Violette Anderson, Vinita Gupta, and Violet Palmer. Each of these women is deserving of a place in the A to Z Challenge. However, because we are in the middle of a presidential race that includes the first woman to run on a major party ticket, I felt the honor this week should go to the first woman who ran for president of the United States, Victoria Woodhull. Many believe that Hillary Clinton is a controversial candidate; I wonder what in the world they would think of Victoria Woodhull. Victoria California Claflin was born in Homer, Ohio in 1838, the seventh of ten children. Her mother was illiterate and her father was known as a petty thief. Victoria didn’t begin school until she was eight, and she only attended sporadically for three years. She and her younger sister Tennessee were often forced to travel with their father in his painted wagon, performing as faith healers and fortune tellers: “Their lives were tumultuous, impoverished, unpredictable and nomadic” (politico.com). Victoria’s parents forced her into her first marriage at age 15, to Canning Woodhull, “a philanderer, drunk and morphine addict” (politico.com). She had two children with Woodhull, a daughter and a son, and her son suffered from serious disabilities. Defying societal convention, she divorced Woodhull, becoming a single mother to her two children before marrying again sometime around 1866. Her second husband, Colonel James Blood, was a Civil War hero and a spiritualist: “Blood was a political and social radical—he called himself a ‘free lover’—who encouraged Victoria’s self-education and interest in women’s rights. He also encouraged the sisters to move, in 1868, to New York, where he lived at times, and where their lives took shape in a way that no one who observed them paraded and exploited in their father’s ‘creaking medicine show wagon’ could have predicted. What makes those lives so extraordinary is that they managed to emerge from the physical and spiritual abyss of their childhood; Victoria especially, from a poisonous first marriage, transformed into a woman with a mission—determined and fearless in her demands that women have an equal place in the country” (politico.com). In New York, the sisters caught the attention of railroad and shipping millionaire Cornelius Vanderbilt, who, in 1870, set them up in business as “the first women to found and run a Wall Street brokerage firm” (politico.com). With the money they made, they founded a radical newspaper, Woodhull & Claflin’s Weekly, which remained in business for six years. It was also in 1870 that Victoria announced that she was running for president as a member of the Equal Rights Party, which she helped organize: “The heart and soul of her platform was a society free of a government that makes laws which interfere with the rights of any individual, man or woman, black or white, ‘to pursue happiness as they may choose.’ She believed that women should be free to find their true love, with or without marriage. Ideally, she lectured, they might remain monogamous, although monogamy was not a realistic goal in most marriages, which, she added, are riddled with ‘miseries’” (politico.com). She believed that the 14th and 15th Amendments already guaranteed women the right to vote, and she made this argument before Congress. In one of her speeches delivered in New York City, she declared that she had “an inalienable, constitutional and natural right to love whom I may, to love as long or as short a period as I can; to change that love every day if I please” (qtd. in politico.com). I’m not sure what today’s pundits would make of that, but she would have earned my vote. Three days before election day, she and her sister published details about the alleged adultery committed by Brooklyn minister Henry Ward Beecher, who had condemned Victoria’s views of love and marriage: “In getting her revenge, she explained that she objected, not to Beecher’s adultery, but to his hypocrisy. ‘I am not charging him with immorality—I applaud his enlightened views. I am charging him with hypocrisy’” (qtd. in politico.com). The sisters, along with Victoria’s husband, who wrote many of the newspaper’s articles, were then arrested and charged with indecency as well as publishing an obscene newspaper and sending it through the mail: “Police took the sisters into custody on November 2, and they remained in jail for about a month. Additional arrests followed, including one after a briefly on-the-lam Woodhull snuck up on stage in disguise in order to give a speech. The sisters were eventually found not guilty, but not before taking a beating in the press. Their harshest critics included Harriet Beecher Stowe, Beecher’s sister and the author of Uncle Tom’s Cabin, who called Woodhull a ‘vile jailbird’ and an ‘impudent witch,’ and cartoonist Thomas Nast, who depicted Woodhull as ‘Mrs. Satan’” (history.com). She divorced Colonel Blood and closed the newspaper in 1876, and then escaped the increasing criticism directed at her by traveling to London in 1877. There she married a wealthy Oxford educated banker named John Biddulph Martin: “She resided there until her death in 1927, devoting her later years to running a new newspaper and preserving the English home of George Washington’s ancestors. Woodhull also became an automobile enthusiast, donated money and services to the townspeople around her estate, traveled overseas to run again for U.S. president in 1892, founded a short-lived agricultural school and volunteered with the Red Cross during World War I” (history.com). 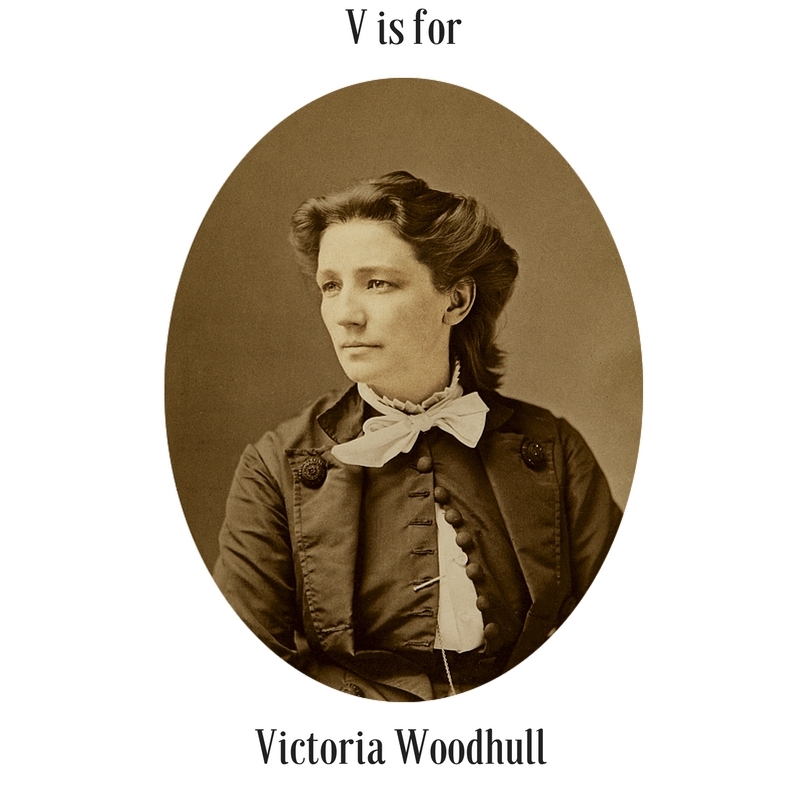 V is for Victoria Woodhull, a woman who still today would be considered generations ahead of her time.